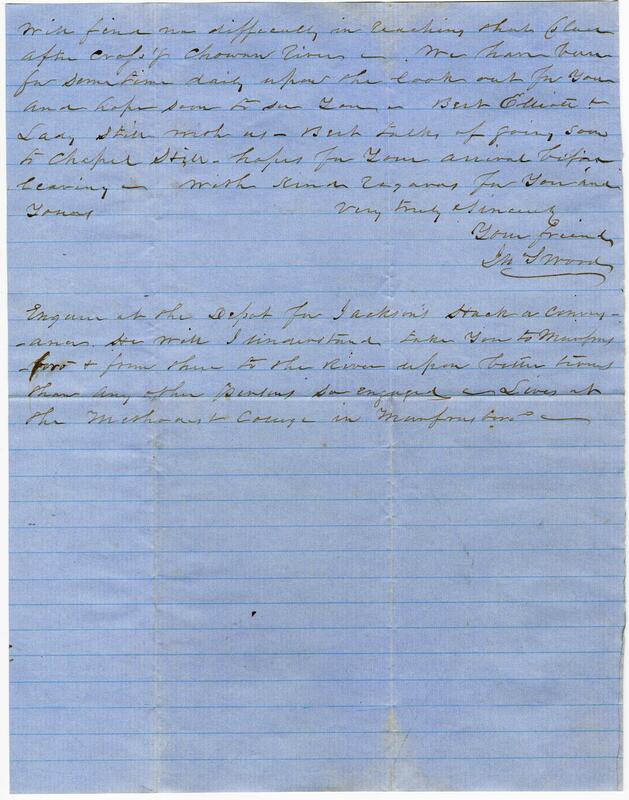 Item Description: Letter from John S. Wood of Hertford, NC to John Kimberly of Chapel Hill, NC. 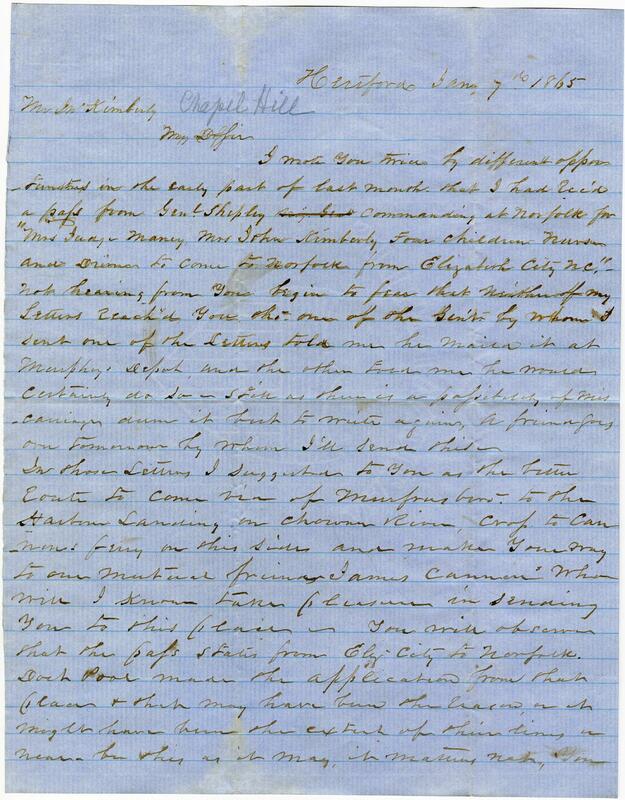 He writes that he has acquired a pass to take the women and children from Elizabeth City, NC to Norfolk, VA. He provides directions for getting them to Norfolk, encouraging them to travel through Murfreesboro, NC. He also mentions issues with the mail because this is the third letter he has sent to Kimberly regarding this pass. I wrote you twice by different opportunities in the early part of last month that I had rec’d a pass from Genl Shipley commanding at Norfolk for “Mrs Judge Maney, Mrs John Kimberly Four children nurse and Driver to come to Norfolk from Elizabeth City NC.” Not hearing from You begin to fear that neither of my letters reach’d you tho one of the Gen’l by whom I sent one of the letters told me he mail’d it a Murphy Depot, and the other told me he would certainly do so. Such as there is a possibility of miscarriage dum it but to write again a friend goes over tomorrow by whom I’ll send this. In those Letters I suggested to you as the better route to come via of Murfreesboro to the Harbour Landing on Chowan River, cross to Cannon’s ferry on this side and make your way to our mutual friend James Cannon who will I know take pleasure in sending you to this place. You will observe that the pass states from Eliz City to Norfolk. Doct Pool made the application from that place and that may have been the ? or it might have been the extent of their times in near. Be this as it may, it matters not, you will find some difficulty in reaching that place after crossing Chowan River. We have been for sometime daily upon the lookout for you and hope soon to see you. Best Elliot and Lady still with us. Best talks of going soon to Chapel Hill, hopes for your arrival before leaving. With kind regards for you and yours. Inquire at the Depot for Jackson’s stuck a conveyance. He will I understand take you to Murfreesboro and from thereto the River upon better times than any other persons so engaged. Lives at the Merchant Courage in Murfreesboro. This entry was posted in Southern Historical Collection and tagged Elizabeth City, John Kimberly, Murfreesboro, Norfolk, passes, travel. Bookmark the permalink.